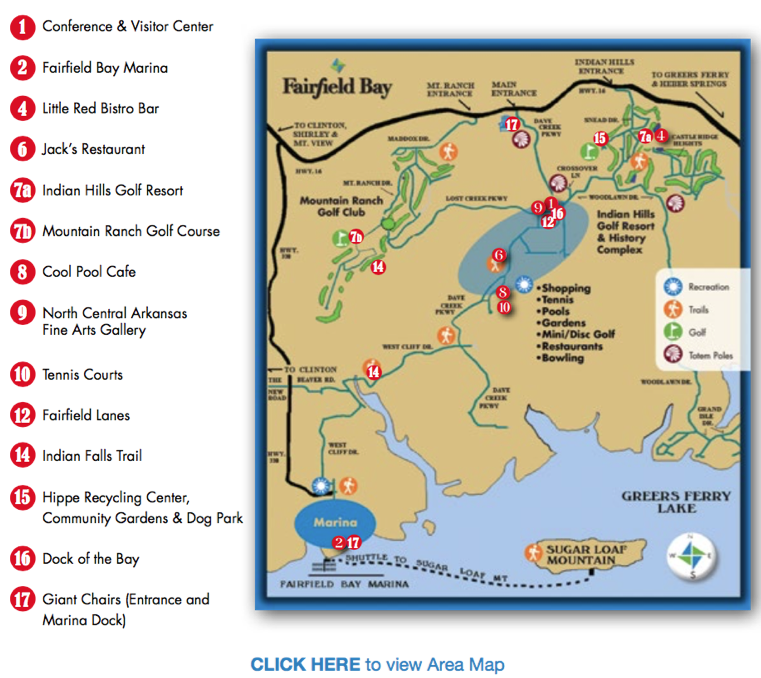 Today, you’ll start at the Conference & Visitor Center to get an overview of all The Bay has to offer, and then dip your toe into the refreshing lake as you begin to relax and take in the spectacular views. Dive into summer at Fairfield Bay. 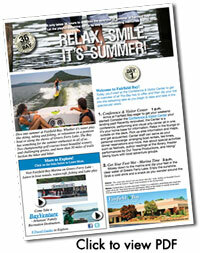 Whether it’s water play like skiing, tubing and fishing, or relaxation on a pontoon boat or along the shores of Greers Ferry Lake, The Bay has something for the summer enthusiast in all of us. Two championship golf courses boast beautiful scenery and challenging greens, and more than 30 miles of trails beckon the hiker and biker. If it’s arts you crave, movies and theater productions dot the summer landscape and local galleries and classes celebrate the artist in you. 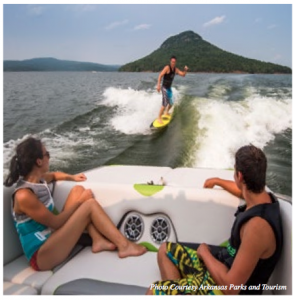 The water play doesn’t get any better that this: wake surfing on beautiful Greers Ferry lake, with the historic Sugar Loaf mountain in the background. 1. Conference & Visitor Center 1 p.m. Arrive at Fairfield Bay eager to get your weekend started! Consider the Conference & Visitor Center your landing pad! Recently renovated, the Center is a conference, performing and visual arts center all in one. It’s your home base for information. Relax in the lounge or outside on the deck. Pick up area information and maps, and get acquainted. Center staff can serve as your personal concierge: arranging boat rentals, tee times, dinner reservations and more. 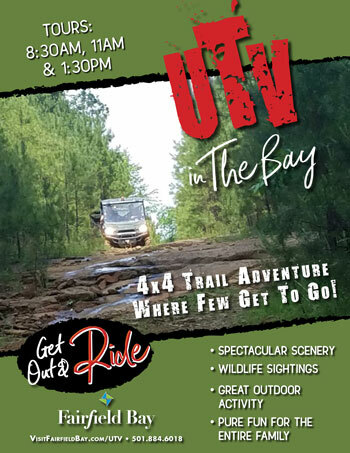 Ask about special activities such as festivals, author readings at the library, theater performances by Our Towne Productions, and hiking/ biking tours with local adventure groups. 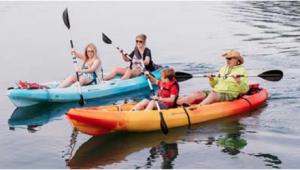 Kayaking and stand-up paddle boards (SUP) are a terrific form of exercise and everyone in the family can give it a go. 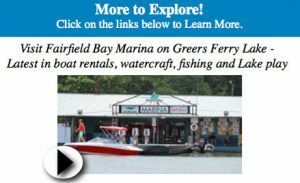 Rent one today at the Fairfield Bay Marina, 501-884- 6030. 2. Get Your Feet Wet – Marina Time 3 p.m.
to fishing poles. Speaking of fishing – start your vacation right now! Rent one of our fishing pontoons or tri-toons, and drop a line for some fishing time! Play a little, grab a kayak, stand-up paddle board, paddle boat or the latest watercraft fun, like jet skis, Hobie Eclipses, or the only CraigCat on Greers Ferry Lake. Make sure to say hi to some locals who can provide insider tips for the best places to fish or a special swimming hole. 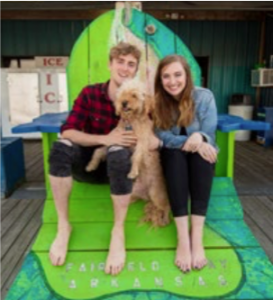 Before you leave the dock, snap a pic in the giant fish chair. 3. Relaxing View 5 p.m.
Time to relax. 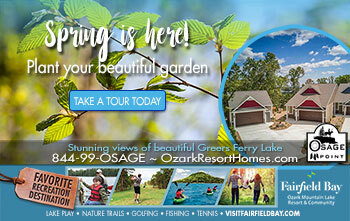 Find a nearby bench to take in the gorgeous afternoon sun over Greers Ferry Lake. Look through the information you picked up at the conference center, but you may soon discover that the breathtaking views command your full attention. Feel all your pre-vacation tension slip away as the water laps the shores. 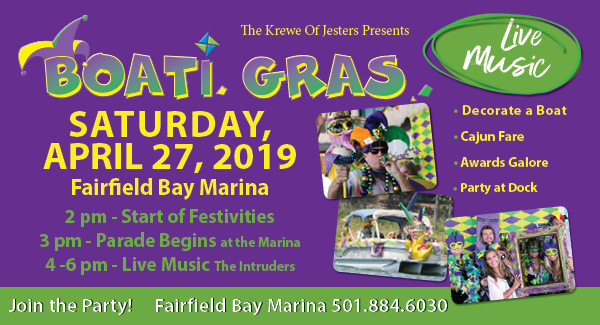 If you prefer to stretch your legs, take a walk along the shoreline; maybe you’ll see some late afternoon fishermen bringing in the day’s catch, or some folks getting a last waterski in before nightfall. 4. Catch of the Day. 6 p.m. If your day included catching fish, take advantage of a nearby grill and enjoy a freshly cooked meal of your own making. Prefer to have someone else cook the fish? Little Red Bistro Bar at Indian Hills is a favorite with locals who say who say the Grilled Salmon or the Ozark Mountain Fish & Chips are a must try while you’re here. . Check out our full listing of The Bay restaurants. Fairfeld Bay’s ‘Center’ is a conference, performing and visual arts center all in one. Your home base for information. Relax in the lounge or outside on the deck. 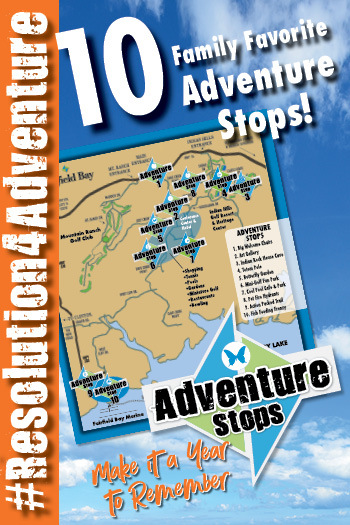 Pick up some area information and maps, and get acquainted. 5. Dinner, Concert, Movies and More! 8 p.m. Still up for some fun? Check in with the Conference and Visitor Center and see what’s on tap around town. Outdoor concerts, open mic nights, Cool Pool summer movies and Glow Bowling are just a few of the things the Bay offers after dark. Today is all about the beautiful outdoor paradise that is Fairfield Bay. If you find yourself awake before dawn, peek out your window to see the sunlight creep through the trees behind your condo. Grab your binoculars and your bird watching list. 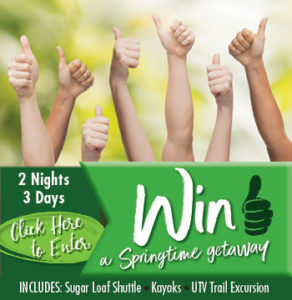 Oh, and be sure to stay in touch with the latest happenings on our Facebook page. 6. Tea & Tee time! 7 a.m.
Yum… Stop by Jack’s to grab your morning “cup of joe” or a morning iced sweet tea and a scrumptious breakfast sandwich. Then head over for your early morning tee time! 7a. Fore!! Grab Those Clubs 8 a.m. If golf is your passion, have we got a green for you! Indian Hills Golf Course is carved into the hills and valleys of the Ozarks, offering some breathtaking views and challenging golf. 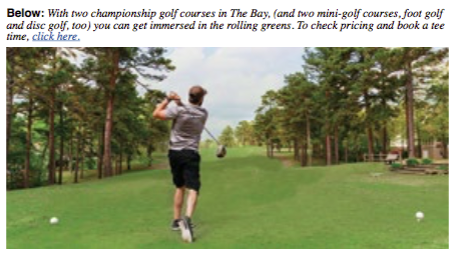 Known by its tree-lined fairways, deep bunkers, small sloped greens, you can enjoy it on your own or join in with some of the locals and learn more about the Bay as you play. The golf course is known for its beautiful scenery and challenging greens. 7b. Consider your second golfing option at Fairfield Bay: Mountain Ranch Golf Course. When you do, you’ll be enjoying Golf Digest’s #1 resort course in the state! Mountain Ranch Golf Club is also part of Arkansas’ Natural State Golf Trail. Don’t miss the BayView Pool with its stunning view of the lake and poolside dining from the Cool Pool Cafe. 8. Lunch with a VIEW 12:30 p.m. Cool off at the Cool Pool Cafe, adjacent to the BayView Pool – where casual and cool come together. Guests will enjoy either poolside or indoor dining; both of- fer breathtaking views of the lake. Inside, guests can cool off under the giant fan with ice cream, a cool beverage or cafe food. Take a dip in the pool or watch your little ones splash around the walk-in kiddie pool. 9. Art Anyone? 1 p.m. When you stop by the conference center to mail your postcards, enjoy the artwork at the North Central Arkansas fine arts gallery, featuring works of stained glass, paintings and sculpture; many of these one-of-a-kind pieces are available for purchase… what a perfect souvenir! 10. Get out and Ride 2:30 p.m. 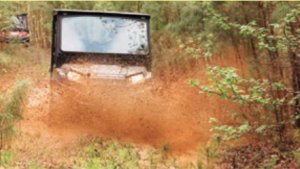 Try a little o road adventure on our ATV/UTV trails wandering through over 90 miles of dirt back roads and trails, exciting mountain ridges, gullies, water paths and creek beds. Daily tours include a trek through our new 20 acre fun park complete with wooded and water obstacles. Yet another option is the recreation center—a full afternoon’s adventure in itself. Eight tennis courts (lighted, so you can enjoy an evening sunset ‘set’) wait for you; racquets can be checked out for a nominal fee. And don’t forget the pool – a cool refreshment on a summer’s afternoon. 11. Evening Picnic 5 p.m. 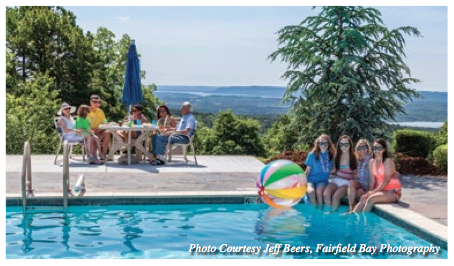 Whether at the lake or the rec center, consider grabbing a party grill and enjoy your dinner and the beautiful day watching the kids play in the park, or on the shore as you watch another gorgeous summer’s day come to an end in the Ozarks. 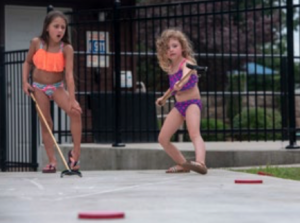 If you need a break from water play, grab a shuffeboard cue from the on-site Recreation office, and show off your skills. Volleyball courts and horseshoe pits are also available for some friendly competition. 12. It’s About Entertainment 8 p.m. If you’re still craving entertainment, The Bay offers many options: bowling, a game of pool, or karaoke. The amphitheater often features live shows. 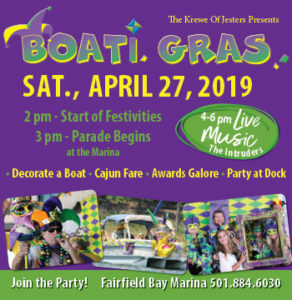 See what’s happening at the BayView pool and Cool Pool Cafe, or you may be lucky enough to catch an Our Towne live production. 13. Nightcap on your Deck 10 p.m. Unwind on your condo balcony with a pre-bedtime beverage. Let the tree frogs and crickets sing you a lullaby. Sweet dreams! Your balcony may tempt you to enjoy a leisurely morning, watching the sunrise, counting species of wildlife and counting your blessings. Or your night’s rest may have you ready to take in all you can before you leave today. Either way, your last day at The Bay is sure to fill your heart with joy and ready to re-enter “regular” life. 14. Morning Stroll 8 a.m. Your stay at The Bay would not be complete without a stroll through the Bay’s gardens or a hike on the beautiful system of trails. The Indian Falls Trail is just under a mile in length and is a moderate trail with a beautiful path along the rim of Wild Horse Canyon. With two rock formations and two waterfalls, it’s a bright way to start your day. The trail ends at Indian Falls, the larger of the two waterfalls. Follow Dave Creek Parkway to the Methodist Church, turn right on West Cliff Drive next to the church. You can see the trail entrance on the right after you pass Riverview Drive. Do be careful when the trail is wet and mindful that the trail does get close to the canyon’s edge in a few spots. Or check out Ed Leamon Park. These award-winning gardens were created by the Van Buren County Master Gardeners. Rose and butterfly garden, walking paths, and water features will gleam in the morning sunlight – nice photo opportunities. Just a short walk away in Woodland Mead Park, you can see an authentic “Indian Thong Tree”. These trees were cultivated by Native Americans to denote a trail or other important feature. When you’re here in The Bay, you’re like family. So take a seat, have a chat and be sure to snap a pic. Always remember you have a great BIG welcome waiting for you here. Right at the entrance to Fairfield Bay and at the Marina. 15. Save a Little Time to See… 10:30 a.m. The Library – if the used book sale is on, you may score a great read for the drive home! Wander by the unique Hippe Recycling Center, see the community vegetable gardens, get a few big tail wags and kisses at the local dog park and more. You’ll soon discover that you’ll need another visit to The Bay to truly experience everything Fairfield Bay has to offer! 16. Scrumptious Pizza for the road? 12 p.m.
Dock of the Bay, the locals’ favorite, offers a fresh handmade pizza you won’t soon forget. The fun-loving staff will make you wish you had planned another day or two at The Bay. 17. Sit & Stay a While 1:30 p.m. Always feeling like you are home is part of the Fairfield Bay charm. To take a piece of that memory with you, be sure to stop for one last photo at the landmark “Giant Chairs.” The giant sh chair is at the marina, and the giant blue chairs are at the entrance inviting all who enter to sit a spell and stay awhile. Vow to return as soon as possible!